A new vibrant summer is coming to us, have you got the plan to make you always-energetic kids occupied with some funny activities. How about doing some word search, allowing your kids to learn in the playing? For this reason, we spent some hours to collect 35 free printable summer word search in PDF or images in 3 different difficulty levels: easy, medium and challenging. You can free download or print these word search PDF files, as we test, all the resources are safe to use. In the case that you want more printable summer word search in printable PDF, following 2 websites are good place for you to find out some funny ones, additionally, they offer other free resources to keep your kids busy with having fun. It is created by a couple of parents who wanted to keep their kids busy while they were working. There are abundant of free resources are given, tutorials to do crafts, flashcards, printable word search, worksheets, puzzles, etc. The particular reason why I put it on the top of the list lies in that, bigactivities gives resources in printable PDF with high resolution. Also, all the resources in the same type are well organized for users to pick from a category. How to Use: Choose your preferred word search, then click the “Print” button at the bottom of the file to print out. Another platform to offer printables and worksheets, helping to develop some basic educational skills. All the printables are categorized in different themes, such as animal, birthday, food, family, movies, seasons, sports, and so on. For summer word search, there are 7 word searches available on this website. 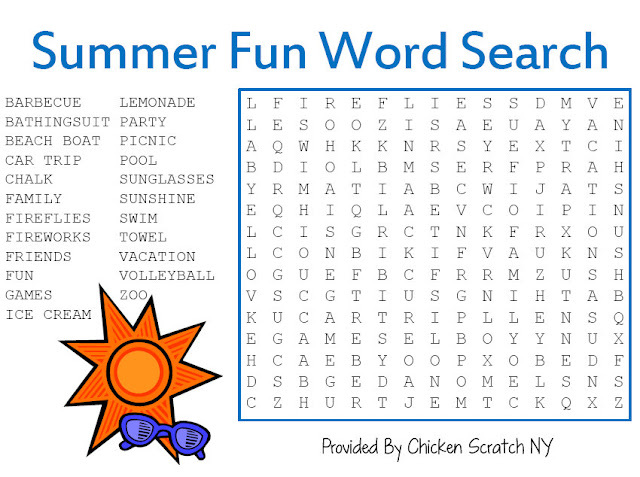 How to Use: Choose your preferred summer word search, print the webpage out. Also, if you have a tablet, playing summer word search game online is an extra fun for your kids. Here we recommend primarygames. Most of online games allow pop-out advertisements for commercial purposes, while primarygames is one with relatively fewer advertisements on its webpage. Also, the game loads fast and responds timely for users to play the game efficiently. Even, users can print the word search to do offline. So, which ones are your favorite? Or do you have any other good summer word search resources for us? Please leave us a comment in the following. Easter, to celebrate the day of Jesus' resurrection, is a significant festival for Christians. They think Easter is a symbol of rebirth and hope, so in that day, Christians recite lovely prayers, hymns and songs. Here we are listing top 20 funny Easter songs that are most frequently sung or played.